Description: Former President Gerald Ford makes a decision not to run as Ronald Reagan’s vice presidential running mate at the Republican National Convention in Detroit, Michigan. July 16, 1980. Description: Former President Ford visits the University of Michigan football team and its coach, Bo Schembechler. Ann Arbor, Michigan. November 11, 1982. 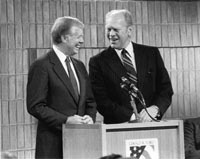 Description: Former Presidents Jimmy Carter and Gerald R. Ford co-host an All-Democracies Conference at the Gerald R. Ford Library in Ann Arbor, Michigan. February 9, 1983. Description: Three former presidents join President Bill Clinton in the White House for a NAFTA Breakfast Meeting, September 14, 1993. Description: President Clinton awards former President Ford the nation’s highest civilian honor, the Presidential Medal of Freedom, in a White House ceremony on August 11, 1999. Description: President Ford and First Lady Betty Ford receive the Congressional Gold Medal from Speaker of the House Dennis Hastert and Senator Strom Thurmond. Also shown is President Bill Clinton. October 27, 1999. Description: Caroline Kennedy and Senator Ted Kennedy present President Ford with the John F. Kennedy Foundation’s Profiles in Courage Award. May 21, 2001.